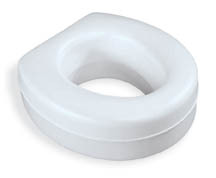 Molded Plastic Raised Toilet Seat Is Contoured for Patient Comfort and Provides Excellent Support 300-lb. weight capacity. Constructed of heavy-duty white polyethylene, it raises seat level by 4 1/2". Seat width is 15"; 300-lb. weight capacity.